In one recent survey of 400 companies with at least 100,000 employees, the companies cited an average loss per company of $62.4 million per year because of inadequate communication to and between employees. In another survey, 80 percent of HR professionals reported interpersonal communication as very important when advancing their careers. Perhaps more telling, directors and C-suite executives placed an even higher value on the need for interpersonal skills in the HR role: A total of 87 percent of directors and 83 percent of C-suite executives identified these skills as primary for success. The HR practitioner with strong communication skills will be strategically positioned to have a great impact in the workplace. The role of HR professionals has become increasingly complex--and is likely to become even more complicated in the foreseeable future. Today's HR professionals have taken on a more strategic role that has increased their visibility throughout their organizations. As strategic business partners, HR professionals interact with executives, line managers, rank-and-file employees, and outside stakeholders. With this increased visibility comes an opportunity to influence the organization and its strategic objectives. This opportunity, however, depends in large part on the HR professional's ability to effectively communicate up (to superiors), down (to subordinates), and sideways (to peers). Up, Down, and Sideways: High-Impact Verbal Communication for HR Professionals was written to help HR practitioners--at all levels--become better verbal communicators, thereby making them better at their jobs and more valuable to their companies. 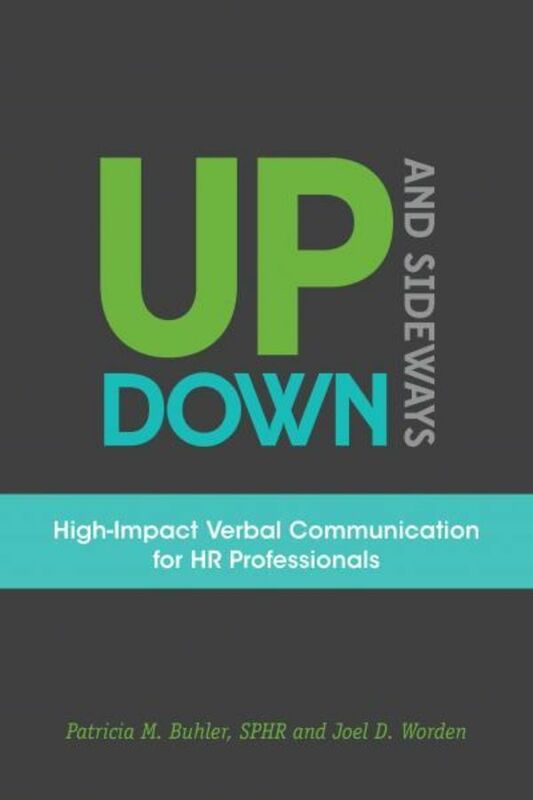 In addition to general public and interpersonal speaking tips sprinkled throughout, the book specifically addresses the many hats of the HR professional. Whether in a generalist or specialist role, HR practitioners' wide range of responsibilities can only be effectively met with strong communication skills. Staffing the firm, training employees, developing and implementing policies, and integrating HR needs with the overall organization are all responsibilities that require effective communication. Just as the SHRM's HR Competency Model helps individuals "develop a road map to achieve your HR professional goals," this book draws on the application of those competencies to assist the HR professional in making a measurable impact on the organization's goals and outcomes. Patricia M. Buhler, DBA, MBA, SPHR, is a professor of management at Goldey-Beacom College and is the owner of Buhler Business Consultants. Pat is active in Delaware's chapter of the Society for Human Resource Management. Her previous books include Perfecting the Art of Management: A Comprehensive Guide to Organizational Leadership (2010), The Employee Satisfaction Revolution: Understanding and Unleashing the Power of a Satisfied Workforce (2009), and Human Resource Management: All the Information You Need to Manage Your Staff and Meet Your Business Objectives (2002). Joel D. Worden, Ph.D., is an associate professor of English and communication at Goldey-Beacom College. Joel consults with businesses and individuals to increase the effectiveness of their verbal and written communication.